for Your Bar or Restaurant Yet? The NFL Season is Underway! Will your bar and restaurant customers be able to watch their favorite teams on your TVs? 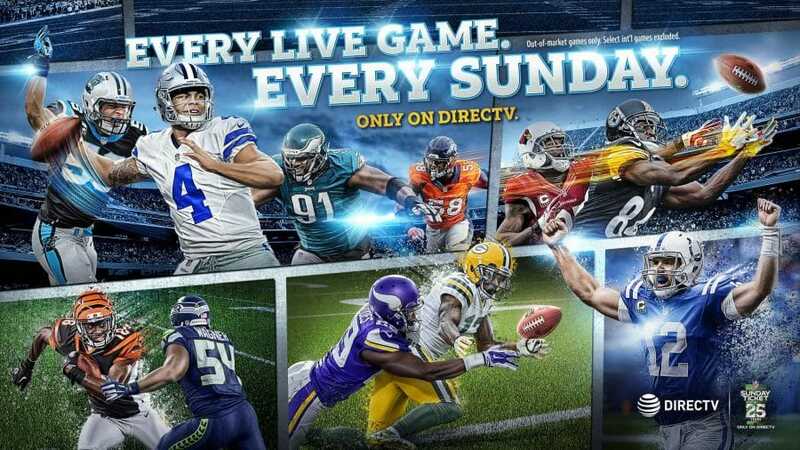 Only DIRECTV brings you, and your Bar and Restaurant customers, every play of every live out-of-market game, every Sunday. Get the action on your Bar or Restaurants TVs with NFL SUNDAY TICKET. You get live games, the Mix Channel with up to 8 games on one screen, real-time highlights, and the RED ZONE CHANNEL®. You won’t find anything like it on DISH or cable. It’s available only on DIRECTV. DIRECTV heard you and you can get 2018 NFL SUNDAY TICKET for your Bar or Restaurant with a Fire Code Occupancy (FCO) of 50 or less and 1-4 TVs for just $699.00. Make sure to ask about the NFL Sunday Ticket Promo Kit for your bar/restaurant. 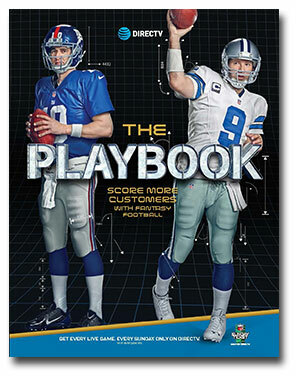 It is available at no extra charge as part of DIRECTV’s MVP Marketing Program for NFL Sunday Ticket Subscribers. 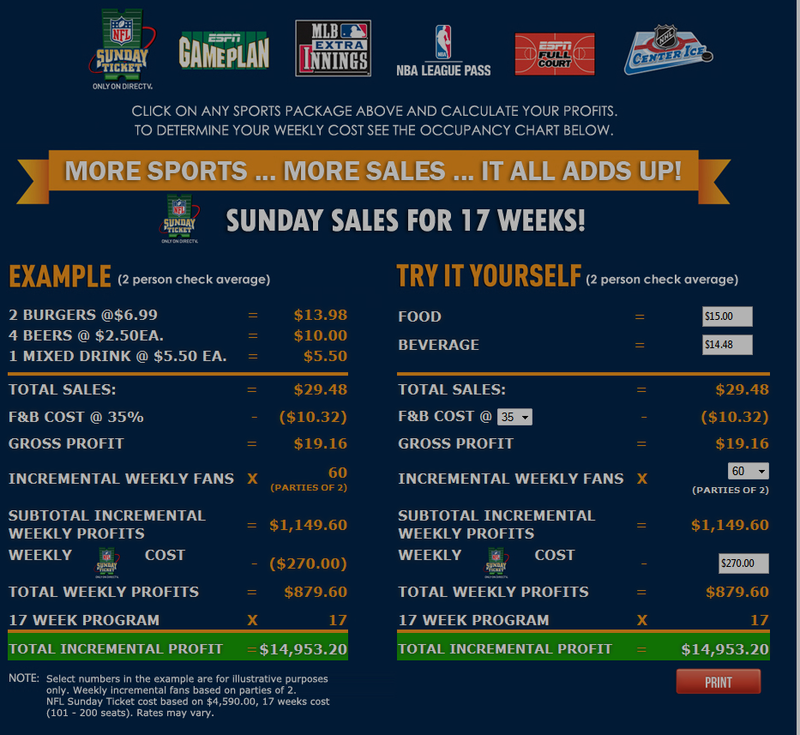 If you have considered NFL Sunday Ticket for your bar or restaurant and want to know how much money you could make from adding it for next season, check out DIRECTV’s NFL Sunday Ticket Profit Calculator. 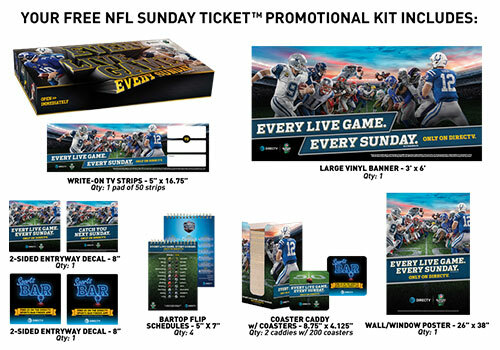 NFL SUNDAY TICKET marketing kits began shipping in Mid-August to all DIRECTV bar/restaurant customers who subscribe to the 2017 season of NFL SUNDAY TICKET. 2018 NFL Fantasy Football Marketing Kits are available on directvmvp.com! The kits are available to all existing and new DIRECT for BARS and RESTAURANTS customers. To order a Fantasy Football Marketing Kit kit, you do not need to be an NFL SUNDAY TICKET subscriber, just a DIRECTV public viewing subscriber. The playbook contains information that you as a Bar or Restaurant owner can us to get ready to hold a successful fantasy football draft in your establishment. The planogram gives you a guide on where to best place the marketing materials in the Fantasy Football Marketing Kit in your bar or restaurant. According to Forbes.com, NFL Fantasy Football was a $70 billion business in 2015 and Sports Degree Management says that 56.8 million in the US participated in NFL Fantasy Football leagues . The NFL Fantasy Football Marketing Kit from DIRECTV is a great way for you to draw in customers interested in holding a draft for their league at your bar or restaurants and generate more sales. Having NFL SUNDAY TICKET is an opportunity for you to draw even more patrons who are looking for places to root for their favorite players playing in out-of-market games each week. To order an NFL Fantasy Football Marketing kit for your restaurant log on to DIRECTVMVP.com and use your existing credits when ordering. The kits will begin shipping on Mid-August. Not a DIRECTV for BARS and RESTAURANTS Subscriber Yet? $200 BILL CREDIT OFFER: To receive the promotional one time credit of $200, customers must sign up for 2018 NFL SUNDAY TICKET with Fire Code Occupancy (FCO) 1-200 (excluding Small Bar Offer). Credit to be issued on or after 9/9/18. May take up to two billing cycles for credit to appear after 9/9/18. FCO validation certificate must be approved. NFL SUNDAY TICKET must be activated. $500 BILL CREDIT OFFER: To receive the promotional one time credit of $500, customers must sign up for 2018 NFL SUNDAY TICKET with Fire Code Occupancy (FCO) 201 or above. Credit to be issued on or after 9/9/18. May take up to two billing cycles for credit to appear. FCO validation certificate must be approved. NFL SUNDAY TICKET must be activated. ABP OFFER: New customers who subscribe to BUSINESS SELECT PACK or above with 24-mo. agmt. and enroll in Auto Bill Pay at time of sale will receive $10/mo. bill credit for 24 mos. starting in the 2nd mo. After (24 mos.) the credit will end and services will automatically continue at the then-prevailing rate. 2018 NFL SUNDAY TICKET SMALL BARS OFFER: In order to receive NFL SUNDAY TICKET for Small Bars, customers must subscribe to a commercial base programming package with a 24-month agreement. 1-pay new customer pricing of $699 is based on Fire Code Occupancy (FCO) 1-100 only and is subject to verification. New NFL SUNDAY TICKET subscribers must order by 10/28/18 and activate by 11/28/18 to be eligible for the 1-pay option. Customers must order by 9/30/18 and activate by 10/31/18 to be eligible for the 3-pay option. Customers must order by 7/30/18 and activate by 8/31/18 to be eligible for the 5-pay option. Offer available to customers with 4 or less receivers. Customers with more than 4 receivers will pay the standard rate for FCO 1-50 or 51-100. NFL SUNDAY TICKET consists of all live out-of-market NFL games (based on customer’s service address) broadcast on FOX and CBS. However, games broadcast by your local FOX or CBS affiliate, and select international games, will not be available in NFL SUNDAY TICKET. Other conditions apply. 2018 NFL SUNDAY TICKET INCLUDED AT NO EXTRA COST OFFER: Requires activation of BUSINESS XTRA PACK or BUSINESS ENTERTAINMENT PACK. 2018 NFL SUNDAY TICKET retail price is $569 (Business Viewing) and $454 (Private Viewing). Regional Sports network fee of up to $5.99 applies in certain markets for BUSINESS XTRA PACK. Regional Sports Network Fees are updated biannually based on the presence of Regional Sports Networks programming in applicable ZIP codes. Customers activating BUSINESS XTRA PACK or BUSINESS ENTERTAINMENT are eligible to receive the 2018 season of NFL SUNDAY TICKET at no additional cost. The remaining balance of NFL SUNDAY TICKET will be charged to customer’s account in the event of early disconnect. NFL SUNDAY TICKET consists of all live out-of-market NFL games (based on customer’s service address) broadcast on FOX and CBS. However, games broadcast by your local FOX or CBS affiliate, and select international games, will not be available in NFL SUNDAY TICKET. Other conditions apply. LIMIT ONE NFL SUNDAY TICKET OFFER PER ACCOUNT. Offer void where prohibited or restricted. NFL SUNDAY TICKET subscription will automatically continue in 2019 and each season thereafter at then prevailing rate unless customer calls 1-866-945-9940 to cancel prior to start of season. Subscription cannot be canceled (in part or in whole) after the start of the season and subscription fee cannot be refunded. Commercial locations require an appropriate licensee agreement. NFL, the NFL Shield design and the NFL SUNDAY TICKET name and logo are registered trademarks of the NFL and its affiliates. NFL team names and uniform designs are registered trademarks of the teams indicated.